The Tecnifibre ATP Razor Code tennis string ensures excellent durability thanks to the high modulus polyester and is textured for more spin. The string has a monofilament construction and incorporates the Thermocore technology for more flexibility and a softer feel. It is used by the ATP World Tour Players and comes in a 200m (656ft) reel. for submitting product information about Tecnifibre ATP Razor Code Tennis String - 200m Reel We aim to answer all questions within 2-3 days. for submitting product information about Tecnifibre ATP Razor Code Tennis String - 200m Reel. We aim to answer all questions within 2-3 days. If you provided your name and email address, we will email you as soon as the answer is published. 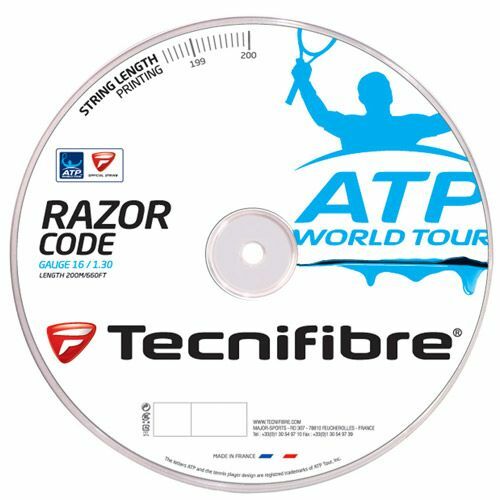 for submitting product review about Tecnifibre ATP Razor Code Tennis String - 200m Reel.